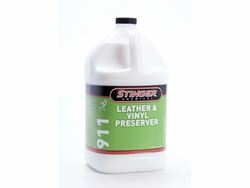 Stinger's Leather/Vinyl Preserver is a deep penetrating conditioner and preserver for maximum protection against spills and fading due to the sun's harmful rays. For professional use only. Available in gallons, 5 & 55 gallon containers. RTU-Leather Scent! !